he history of the kingdom of Gwynedd from the 5th to 11th centuries reflects its struggles against its neighbors within Wales, notably with Deheubarth to the south and Powys to the south-east, and against increasingly powerful Saxon kingdoms of Mercia and Northumbria, which threatened the area east of the river Clwyd. Gwynedd, with its capital at Aberffraw, was naturally strong, its rich Anglesey farmlands protected by the barrier of Snowdonia. At several periods it was Wales' major power, its princes dominating the whole country; but such hegemonies were short-lived, for Celtic society did not recognize primogeniture, and the reluctance of princes to accept any hierarchy among themselves prevented effective consolidation of previous gains. To the swaying struggles of cousins and neighbors were added external forces - the Viking raids of the 9th and early 10th centuries and, in the late 11th century, the advent of the Normans. The details of this history are few and uncertain; the events and personalities of the 5th century, the nature of the crucial Roman withdrawal and the establishment of Christianity as the dominant religion, are all veiled in legend. One historical figure was assimilated into legend; the Roman general Magnus Maximus, who seized the western empire in AD 383 - traditionally from his base at Segontium - became Macsen Wledig, husband of Helen, a British princess and founding ancestor of many Welsh 'tribes'. The story of Cunedda - reputed to be a 5th-century chieftain from near Hadrian's Wall, invited south to defend north Wales against Irish raiders - is more controversial. In contrast to west Wales, there is little evidence for Irish settlement in north Wales. This may indicate that Cunedda was, indeed, successful, but archaeological investigation has failed to confirm his arrival or that of other settlers from the north. The first historical (rather than legendary) figure in Gwynedd is Maelgwyn, who is associated with Degannwy, and who died in AD 549. He is mentioned by the contemporary writer Gildas, and also features in many of the Lives of the north Welsh saints. A reasonably complete list of kings and princes can be complied though some are little more than names mentioned in the 9th-century Annales Cambriae or on gravestones. In AD 825 the dynasty of Maelgwyn ended and was replaced by that of Merfyn Frych. His son, Rhodri Mawr (844-78), being the first acknowledged leader over both north and south Wales. The court of Gwynedd was then a noted center of learning and culture, where all travelling scholars would be royally entertained. Rhodri was successful against both the old Saxon enemy to the east and the new Viking one from the sea. 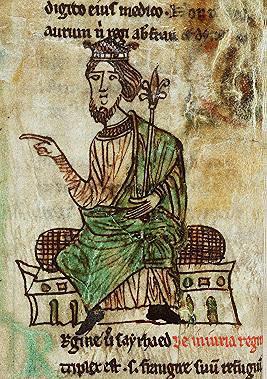 As in England and Ireland, the Vikings did great damage, especially to wealthy ecclesiastical foundations; their passing is recorded in the names of islands and headlands, but there is little evidence of settlement - in contrast to northern England and Ireland, where they established successful kingships. The raids eased in the early 10th century, during the reign of Rhodri's grandson, Hywel ap Cadell, better known as Hywel Dda "the Good" (right). His main base was in the south and his was a time of peaceful consolidation, with the introduction and widespread use of coinage leading to an expansion of trade. But he is best known for his codification of the customary law of Wales, from which a picture emerges of a broad social pyramid with ruler and noblemen at the top, freemen in the middle, and, at the bottom, bondmen or even slaves, tied to the land, living in "bondvills' close to the llys or court, where they worked the lord's land. When Hywel died in AD 950, disunity returned; 35 Welsh princes were killed within 120 years either by Saxons, Vikings or fellow Welshmen. In 1018 the line of Merfyn Frych was ousted by a new dynasty, whose most notable member, Gruffydd ap Llywelyn (1039-63), reunited Wales under his sole control. But by the end he had overreached himself, attracting retaliation from Edward the Confessor's lieutenant, Harold Godwinson. Soon after the defeat of Gruffydd ap Llywelyn, Hugh of Avranches, earl of Chester, and his cousin, Robert of Rhuddlan, were well established east of the river Clwyd by 1086. In the following four years they captured the Welsh ruler, Gruffydd ap Cynan, and founded castles at Deganwy, Bangor, Caernarfon and Aberlleniog on Anglesey. These were of traditional Norman type: an earthen mound (motte) topped by a wooden keep, the main defensive unit, with less significant buildings below, defended by a bank and ditch (bailey). They were usually built within the Welsh maerdrefi, the administrative centers of the native Welsh rulers. After initial success, Norman control in north Wales was short-lived. In 1094 Gruffyed ap Cynan regained his freedom and, with the help of his mother's Irish relations, drove out the Norman earls. The next seventy years, the reigns of Gruffydd (1094-1137) and his son, Owain Gwynedd (1137-70), mark the most peaceful period of Welsh independence, when the native princes absorbed many of the current European reforming ideas and adapted the more effective structures of both church and state to their own society. After the death of Owain Gwynedd in 1170, southern Wales, under Rhys ap Gruffydd (The Lord Rhys) in Dyfed, became dominant, but at the end of the century Gwynedd once again had a powerful prince. Llywelyn ap Iorwerth (shown left) emerged as ruler in 1200, after a fierce family struggle. At his death in 1240 he was undisputed ruler of all pura Wallia, corresponded on equal terms with Phillip Augustus of France, and had hanged one of the most powerful Marcher lords for undue familiarity with his wife, the daughter of King John of England. Llywelyn's reign saw the construction of the first sophisticated stone castles in Wales built by her native rulers. Sited at strategic points peripheral to Snowdonia, often on his summer grazing lands, they guarded the store-cupboard of his kingdom. Simple towers like that in Dinas Emrys, may belong to this program, but his best castles are much more sophisticated, and incorporate details of construction and advanced design being used by some of his friends - and enemies - among the Marcher lords. Dolwyddelan (below right) Dolbadarn, Criccieth, and Castell y Bere in south Meirionnydd still stand as witness to the energy and resources put into the defence of his kingdom after the disastrous attack which it suffered from his father-in-law, King John, in 1211. These castles were probably built between 1220 and 1230. The plans vary: towers are round, square or D-shaped, a ground plan especially characteristic of this series. 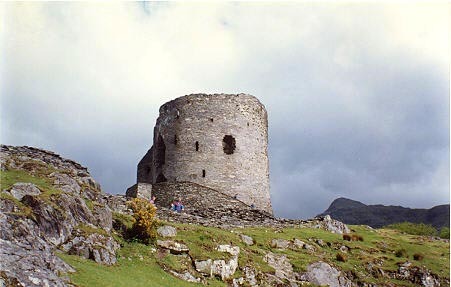 The well-sited castle at Criccieth is undoubtedly the best design, but it might have been surpassed by Degannwy had this crucial site not been destroyed by his son Daffydd as part of a scorched earth policy. t Llywelyn's death the kingdom and Gwynedd's pre-eminence were again threatened by a disputed inheritance and renewed interest from England. Only when his grandson, Llywelyn ap Gruffydd, overcame family rivals in 1255 could the political legacy of Llywelyn the Great begin to be rebuilt by a combination of raids and alliances. Llywelyn's position as effective ruler of all Wales as far south as Caerphilly was eventually recognized by Henry III, in the Treaty of Montgomery (1267). This acknowledged the title "Prince of Wales," and the concept of Wales as a unified state, never explicitly recognized before. The Prince of Wales was a vassal of the king of England but was, in effect, an independent political power. His grandfather's castles still provided the main defence of the kingdom; Llywelyn reinforced and enlarged them, but founded only one new castle at Dolforwyn near Welshpool, far outside his patrimony, begun in 1273 when clouds were already gathering on the horizon. In 1271 Henry III was succeeded by his much more effective son Edward I, and Llywelyn's brothers and uncertain allies began to make trouble for him with the new king. 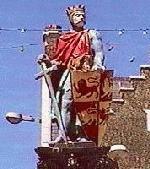 Llywelyn added to his own difficulties by refusing homage, and war was declared in 1276. The first campaign centered upon the Severn and Dee valleys, and Llywelyn was forced to retreat to the river Conwy, Edward consolidating his conquests by the construction of great new castles at Flint and Rhuddlan. At the Peace of Aberconway, concluded in 1277, Llywelyn lost all that he had gained 10 years before. The peace did not last long. Llywelyn's brother, Dafydd, provoked Edward by an attack on Hawarden in March 1282, and war reopened. Llywelyn was killed in a skirmish near Builth Wells and Dafydd had to continue the fight alone. Edward swept down the Conwy valley from Rhuddlan, capturing Dolwyddelan in January 1283, breaking the defensive ring; the other castles fell in rapid succession, and Dafydd was captured and executed in the early summer, thus bringing to an end the house of Gwynedd. Despite creating castles like Dolbadarn and Dolwyddelan, the Welsh did not really adopt the Norman practice of building castles. Out of over 400 which still survive within the modern borders of Wales, less than 10% can be shown to have been built by Welshmen (although the original total must have been somewhat larger). The earliest reference to a Welsh lord planning to build a castle is found in an entry in the Brut y Tywysogyon, the Chronicle of the Princes. It records that, in 1111, Cadwgan ap Bleddyn was slain at Welshpool where he had 'thought to stay and to make a castle'. Five years later, we have the first recorded mention of a castle which has survived to the present day: the mound or motte at Cymer, near Dolgellau, was put up by Uchdryd ab Edwin in 1116. During the rest of the 12th century there are further very occasional references to the Welsh building castles. Where these can be identified today, they are of earthwork form, usually either a motte standing on its own or with an associated bailey. As such, they are indistinguishable from their English counterparts. The scarcity of Welsh castles in the 12th century has rendered impossible any attempt at establishing an overall pattern to their distribution. They were not linked to any particular military campaign, nor do they appear to form part of a broader pattern of land control. Neither, as far as we can see, were such strongholds replacing the role of the llys or court as the centre of the Welsh administrative area, the commote. Rather, each appears to have fulfilled it's own specific role, generally that of controlling routeways. It was not until the 13th century that the Welsh began to build stone castles of a quality comparable to those raised by the English Marcher lords. The finest examples are to be found in the princedom of Deheubarth, the south-west, and within Gwynedd in the north. Indeed, in Gwynedd, where Llywelyn ap Iorwerth rose to power at the beginning of the 13th century, and was quick to adopt the stone castle, one might expect to see a more clearly defined pattern to the use of such strongholds by the Welsh. Building a castle was an expensive enterprise and a major drain on the finances of the princes. Construction would not have begun without a clear purpose in mind. One thing is immediately apparent. Like their 12th century predecessors, these castles were not being built at the commotal llys. The only exception was at Degannwy, on the eastern side of the Conwy estuary, a site of considerable importance dating back to the post -Roman period. The court of Gwynedd was itinerant, moving from one centre to another, and we know that castles came to feature in there itineraries. Their locations suggest that these castles were primarily to serve a strategic function, as well as fulfilling a symbolic and political role. The princes were making it clear to the English Marcher lords, to other Welsh lords (many of whom owed allegiance to them), as well as to their own subjects, that they were true masters of all they ruled. Neither can it be a coincidence that Welsh castles were sometimes used to house important political prisoners. At various times the frontiers of Gwynedd extended right up to the English border. The castle built by Llywelyn ap Gruffydd at Ewloe lay close to the river Dee, and the one he began at Dolforwyn in 1273 lay almost within sight of the royal castle at Montgomery. Further west, Degannwy overlooked the coastal crossing of the Conwy, whilst castles at Carndochan and Castell y Bere guarded the southern border. 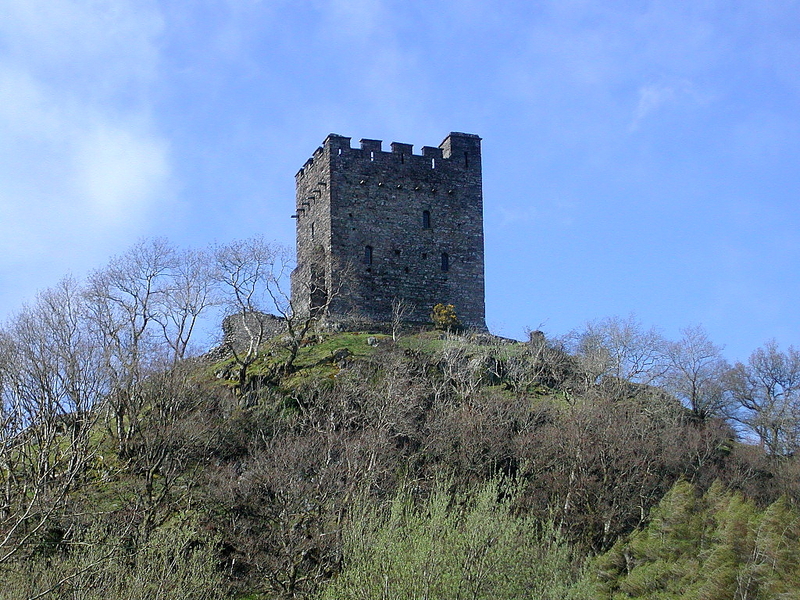 Within the heartland of Snowdonia, the castles of Dolwyddelan and Dolbadarn (shown above) controlled two of the principal routeways through the mountain mastiff. Their location may have also been dictated by that of the princes summer pastures or hafotiroedd. Important vaccaries or cattle ranches were located close to both these castles and, in the south, there was another near Castell y Bere. In the immediate vicinity of Dolwyddelan there were no less than ten vaccaries capable of supposing 552 cattle all year round. The castles would have provided permanent bases for the protection of this source of food. In time of war, mobile supplies on the hoof would have been crucially important to the survival of the men of Gwynedd if forced to retreat into their mountain stronghold.